Have you ever longed to be healthy, have lots of energy, and be comfortable with your body weight? Healthy Habits: 52 Ways to Better Health is an easy-to-read book offering an effective �habit-a-week� approach. Incorporate one new habit per week into your lifestyle across an entire year (52 weeks). Simple habits lead to good health, energy, and optimum body weight. The simpler we keep things, the more likely we are to stick with any changes we make. By following the week-by-week advice within these pages you will see you have the health that you and your body deserve. You will start to regain the energy and vitality you thought you'd lost or never previously attained. Your appetite and body weight will come into alignment with what is healthy for your frame. In essence, you will regain your health back and with it your life. As an expert in nutritional medicine Dr. Cris specialises not just in the prevention and treatment of illnesses, but in the attaining of optimum health. By employing simple lifestyle and holistic medicine strategies Dr. Cris believes that restoration of health and vitality can be achieved for anyone. She has particular interests in weightloss tailored to the individual�s body, fatigue and sleep problems, digestive issues, as well as hormone health. Dr. Cris holds qualifications in medicine, biomedical science, integrative and nutritional medicine, health coaching, as well as personal fitness training. She was the health consultant for The Biggest Loser Retreat on the Gold Coast and is sought after by the media for regular commentary on Juice FM, 4CRB and web TV. She currently practices at The Medical Sanctuary on the Gold Coast, as a registered medical doctor. 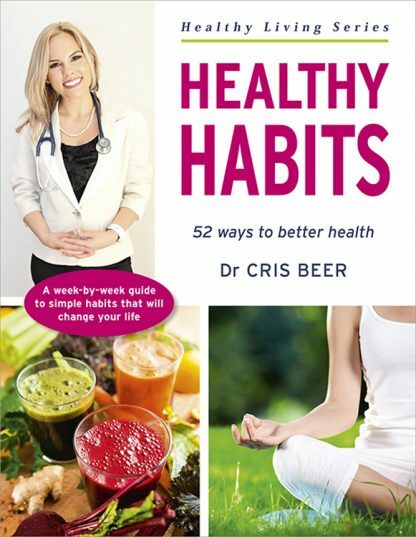 Dr Cris first book 52 Simple Habits to Better Health was released in 2015.